A complete course for beginners, amateurs and professionals. Nine full routines you can use in real-world and professional conditions. 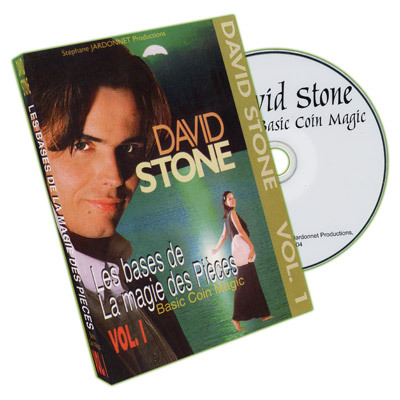 More than 15 basic techniques!Multiple Awards winner ( Diavol Award 1995, Gold Dove Award 1996...), the french magician David STONE performs nine routines in this dvd. All the routines are explained in step by step detail, along with closely guarded moves still used by the world's greatest coin magicians ! Copper Silvered: A copper coin magically changes place with a silver coin... into the spectator's fist ! The Copper/silver classic with regular coins (L'homme MasquÃ© load and the Bobo Switch ). Basic Coin Magic - Vol.1 by David Stone - DVD A complete course for beginners, amateurs and professionals. Nine full routines you can use in real-world and professional conditions. More than 15 basic techniques!Multiple Awards winner ( Diavol Award 1995, Gold Dove Award 1996...), the french magician David STONE performs nine routines in this dvd. All the routines are explained in step by step detail, along with closely guarded moves still used by the world's greatest coin magicians !